Area of Study: Fine Arts, Language Arts, Science, Fine Motor Skills. Ages 5 & Up. Objective: Students demonstrate an understanding of the characteristics and adaptations of organisms living in the grasslands of North America. Notebook for writing the K-W-L chart, research and sketches of plants & animals. Complete a K-W-L chart with your students as you introduce and complete the lesson. Students write the K-W-L chart on their note pads and use it to help guide their research. Learning will be differentiated as students take notes on their research, report their findings to the class, and then create the plants and animals they researched. Provide books, magazines and access to approved, supervised on-line resources. 1. 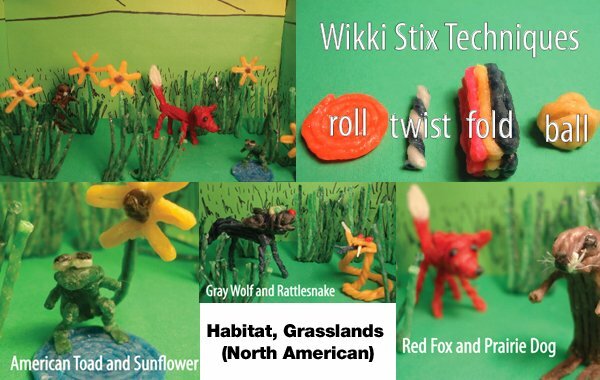 Color the grasslands landscape and use Wikki Stix to attach it to the back of the shoe box. 2. Cut green construction paper and use Wikki Stix to attach it inside the box. 3. Cut and press green Wikki Stix inside the box to create grass. 4. After reviewing the K-W-L chart, students do their own research. Students decide what types of plants and animals they would like to put in the habitat. Students can use approved and supervised internet resources and books. Before students start creating their own plants and animals, a classroom discussion about the types of species students found living in the habitat can be useful. Then, students can discuss their findings, such as whether or not the species is endangered and what people can do to help the plants and animals? 5. Students create their own plants and animals using the Wikki Stix. 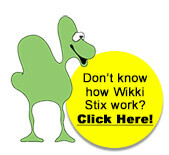 Sunflowers – Use a green Wikki Stix for the stem. Then, fold the yellow Wikki Stix as you move in a circular motion until you make the desired number of petals. Then, cut a small ball of brown Wikki Stix and press it into the center. Prairie dog – body (fold), head (ball), limbs (press 2 together & attach), eyes & nose (small ball), whiskers (cut a few pieces of dental floss and press the pieces under the nose). Rattlesnake – body (twist), head (roll), lower jaw (small roll), tongue (cut in half on tip), teeth (tip of toothpicks), rattle (white Wikki Stix). Gray wolf – body (fold), legs (twist), tail (twist & fold), head (ball) Press the ball to make the head oval. Use scissors to cut open the mouth. To make the ears (fold) a single piece three time and press into a triangle shape. Press the ears onto the head. Red fox – body (fold), legs (twist), tail (red fold and then press into white fold), head (ball). Press the ball to make the head oval. Use scissors to cut open the mouth. To make the ears (fold) a single piece three time and press into a triangle shape. Press the ears onto the head. American toad – body & head (press 4 Wikki Stix together, round the mouth & head at the tip, cut the middle two where you want the body to end), legs (fold the two on each side to make legs and trim off excess), arms (wrap one Wikki Stix around the back), eyes (cut two very small pieces of white & black press together and attach to head).